The 58 Division troops backed by the Commando and Special Forces troops yesterday continued their humanitarian operation to rescue the civilians trapped inside the Safe Zone after reaching the Eastern beachfront dividing the Safe Zone into two enabling more civilians to arrive into the military controlled areas as huge influx of civilians continued till yesterday evening. A police constable who was on civil duty at Dalada Maligawa has returned a lost handbag containing cash Rs. 450,000 to a woman who has left it in the flight of stairs that leads to the balcony of the Maligawa’s Ihala Maalaya. 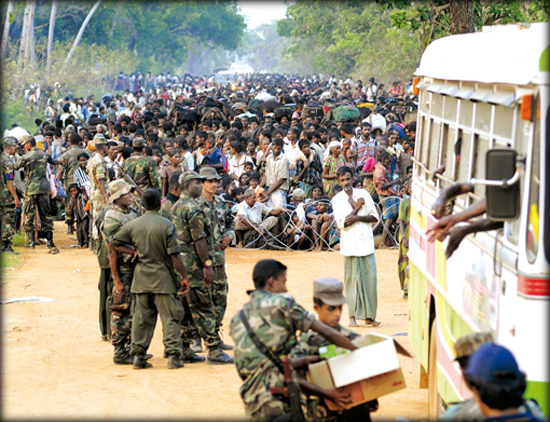 The Security Forces are engaged in the evacuation of innocent Tamil civilians being trapped by the LTTE terrorists in the No Fire Zone and the Government will not halt this mission under any circumstances until the civilians are fully liberated from the clutches of terrorists, Prime Minister Ratnasiri Wickremenayake said yesterday.